Apple’s notebook computers look great, and have for some time. Thin, light and powerful, there is a lot going for Apple’s current lineup. Unfortunately, that quest for ever-thinner devices has left storage as a potential pain point for some, with many of Apple’s notebook computers not packing quite enough hard drive space for people who have, say, a lot of media or play games, perhaps. Whatever the reason, some of Apple’s notebook computers feature surprisingly small numbers in the storage column. Yes, the notebook’s do come in multiple storage options, but the higher end with more storage usually cost a ton a lot than base models. 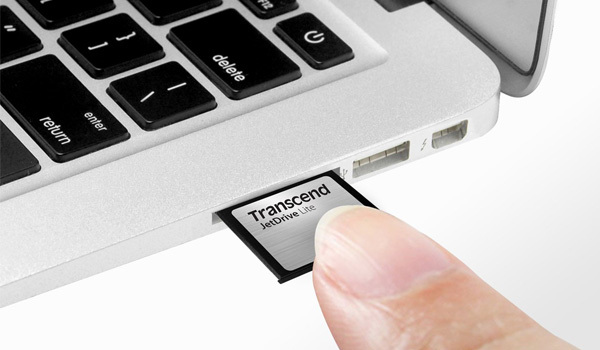 Transcend might have a way of fixing that though, with its line of JetDrive Lite cards, which not only come in cheap, but are also very easy to install in expanding MacBook’s storage. Available in different capacities ranging from 64GB to 256GB of storage, Transcend’s JetDrive Lite makes it possible to quickly and easily add extra storage to either a MacBook Pro or MacBook Air, depending on the screen size. All of the storage devices plug into the memory card slot on the side of the notebooks in question, and provide fast and sizeable storage for those that need it. Prices are generally around the $65 mark for a 128GB JetDrive Lite, rising to approximately $150 for the more spacious 256GB option. Both are good solutions for those that need them, but just make sure you buy the right one depending on the notebook it will be used for – they come in different physical sizes to ensure they stay flush with MacBook’s body and design, so keep that in mind! All sizes for all MacBook models can be picked up right now. If you need to get some extra storage capacity for your notebook, and assuming that notebook is among the ones that are compatible, Transcend’s JetDrive Lite could be just the solution you’ve been waiting for. And let’s be honest, it’s better than buying a new notebook just to get all of your photos onto it! The problem is…when there are SD cards or USBs plugged into the machine, it doesn’t sleep properly, which could lead to battery draining. Can’t you already just plug in any SD card and have it show up as a usable storage device? Of course! The difference with these, though, is that they sit flush against the body of the MacBook, as opposed to a standard SD card that’ll stick out some. What do tou mean? I have this SD 128GB and my macbook sleep properly I think.